Founders’ Day was held on Saturday 11th May 2013 and our invited speaker was Mr Ian Davenport, Chief Executive of the Springboard Bursary Foundation. 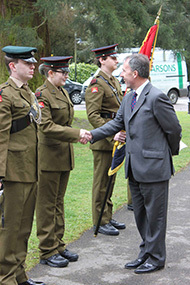 The Mayor of Reigate and Banstead, Mr Roger Newstead, attended the service. The traditional Founders’ Day service included a piano solo by 15 year old Georgina Butler, performance by the Key Stage 4 Ensemble and a musical interlude by Eleanor Edmonds who left in 2008 to study music at Chetham’s School of Music. The Headmaster gave his address and this was followed by an entertaining and thought-provoking speech by Mr Davenport. Mr Davenport handed out prizes to the prize winners and, at the end of the service, there was a retiring collection for the Open Arms Orphanage in Malawi. Welcome to the Mayor of Reigate and Banstead, Cllr Roger Newstead who is also our Ward Councillor. A warm welcome also to Governors and members of the Board of Management, teaching and non-teaching staff, parents, pupils of Year 7 and the Sixth Form and Prize-winners. Our visitor today is Ian Davenport. In the manner of introductions may I first present the School to you, Ian, and then present you to the School. This School is an amalgamation of two schools - the Orphan Working School which was founded in 1758 and 1760, and Royal Albert Orphan Asylum whose 150th anniversary is next year. The two schools amalgamated in 1949 by which time the Orphan Working School had become the Royal Alexandra Orphanage. During the 1950s pupils ranged in age from 18 months to 18 years and the orphanage was funded by private individuals. There was a gradual change into fee-paying state boarding School BUT we still maintain our charitable tradition with 50 boarders and 40 local flexi boarders on free places for "Children who are without one or both parents or whose special circumstances make it desirable that they should go to a boarding School." The age range is now 7-18. We have a small junior School of 140 with some 60 boarders - we are the only state primary boarding provision in this country. The main School takes pupils aged 11-16. There are 700 pupils in total and between 125 and 150 in a year group. 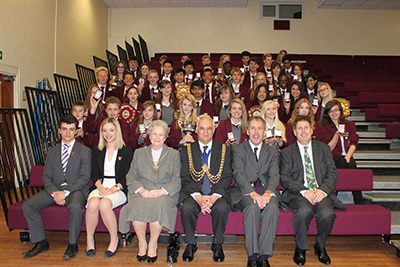 We opened our Sixth Form in September 2010 with 24 students. We now have 140 students and numbers are climbing towards our 200. Having a Sixth Form makes a huge difference. The students look the part and are role models for younger pupils. We currently have 435 boarders and we hope to climb to 450 soon. And now I would like to introduce Ian Davenport: He attended a village school in Oxfordshire and then went to Bloxham School. He moved up to Durham University where he read Politics. Following a career in finance at Arthur Andersen & Co. then Morgan Stanley and then Kleinwort Benson, he went on to become Head of Department (Economics) at St. George's, Weybridge. Next he was appointed Head of Economics and Politics at Radley College and became a housemaster and then Senior House Master, during which time he was also a part-time Economics Tutor at Oxford University. For the last nine years he was Headmaster of Blundell's School, a large boarding school in Devon. He is now the Founding Chief Executive of the Springboard Boarding Bursary Foundation. "I was a bursary pupil myself. I went to one school in a village in Oxfordshire and then to the independent one in the same village, and that was the driving force for me to establish the Springboard Boarding Bursary Foundation." Ian. Welcome and we look forward to hearing what you have to say to us. Traditionally the Headmaster's speech does two things: A Review of Year and the "thinkie bit". So I'll start with the review of the Year. We have had many fixtures. Countless Rugby, netball, Football Hockey, table tennis, badminton, swimming galas, British Horse Society dressage event. We even had the Dodgeball County Final. Year 10 and Year 11 won the Surrey Schools Rugby Shield and there was the inaugural Sovereign's Cup against the other Surrey state boarding school, Gordon's School. The Year 7 netball team won the District League. The Year 10 netball team won the League for the fourth time and the Year 11 netball team won the League for the third time out of 5. Amber Sexton won a silver medal at the British Schools Judo Championships. Jenna Kelly achieved a third gold medal win and the second defence of her title at British Karate Association National Championships. 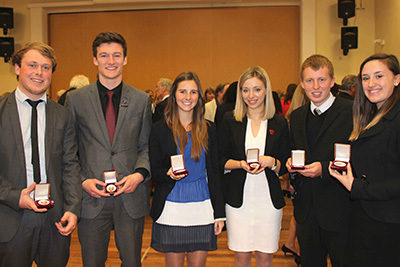 There have been Bronze, Silver and Gold Duke of Edinburgh Award expeditions. One of our PE teachers, Miss Shimmin, entered the Isle of Man 'Superstars' Competition and retained her title having won last year. There have been drama productions. Last night A2, AS and GCSE pupils performed in a drama showcase. We have had Concerts. On Wednesday there was the Choral concert and we are looking forward to the Junior Concert. We expect to offer A level Music in 2014. 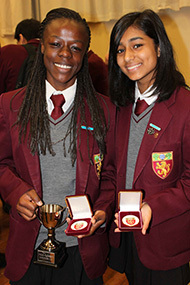 In the Sixth Form there have been lectures, university trips, dance shows, talent shows, inter house competitions. We have had art exhibitions, photography exhibitions, trips to Krakow, Wimbledon, Portsmouth, Reigate, Cadburys World of Chocolate (is that really geography? ), Kempton Park Racecourse (the maths department ?). We had a careers evening. And who can forget Sixth Form Rag week. And that is just a flavour of what has gone on. Oh ..............and we did lessons as well. I would like publicly to thank all my colleagues who work so hard and put in so many hours to make the educational experience here such a rich one. What sort of country, what sort of society will you - the Sixth Form and Year 7 pupils live in ? Or more importantly what will you make it ? It is generally agreed that we, in this country are facing the worst recession we have ever seen in the last one hundred and fifty years. The retirement age going up and up. And pay is not going up as fast as inflation, so you may not feel as wealthy as your parents. Sorry. I did not want to depress you but it does make me feel less sad that I am not as young as I used to be. But what will be the values of the society in which you live ? William Lever was born on 19 September 1851. His father was a grocer. He was the eldest son and the seventh child born to James Lever. They had big families in those days. He created Lever Brothers Soap. He bought 50 acres of land and built a factory AND a small town of 800 houses called Port Sunlight. The garden village had allotments and public buildings including an Art Gallery, a cottage hospital, schools, a concert hall, open air swimming pool, and church. He introduced welfare schemes, and provided for the education and entertainment of his workforce, encouraging recreation and organisations which promoted art, literature, science or music. Why did he do this? Moral purpose of industry and commerce. Not just to make money. Contrast with today: It is the Mission of Advance Auto Parts to provide personal vehicle owners and enthusiasts with the vehicle related products and knowledge that fulfil their wants and needs at the right price. Some companies really go for it: People love our clothes and trust our company. We will market the most appealing and widely worn casual clothing in the world. We will clothe the world. Levis jeans. William Lever may have been slightly eccentric: he thought the only healthy way to sleep was outdoors in the wind and the rain. He died aged 74 of pneumonia ......... but I prefer his mission statement to the others. What does the public - what do you .....think about Moral purpose or the morality of public figures? Public opinion forced a reduction in his pension from £550k to £330k plus he lost his knighthood. But people do not always have to be forced. This week in the papers, a Channel Islands millionaire who started by giving every pensioner on Jersey (yes, there are poor people in the Channel Islands) a £100 shopping voucher for Christmas and gave away £100 million leaving himself with only ten million. But it is not just the wealthy. Charity shops in this country. Collecting tins. I have lost count of the number of cake sales and other charity fundraising events run in School this year. The Sixth Form Rag Week. 7 MST - Mr Stevens' tutor group raised £142 for cancer research recently.